All the right moves were made in this design, Nissan. The Detroit Auto Show might have been skipped by some manufacturers this year, but we're glad Nissan came through. 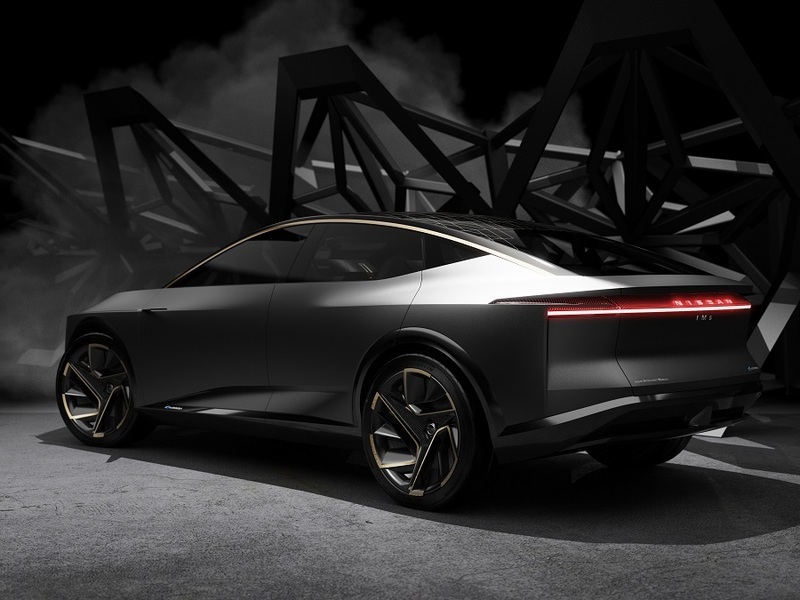 Their new IMs concept is an EV crossover that should get your attention for numerous reasons, not the least of which should be its looks. It's stunning and departs from the current busyness exhibited by the Maxima and the Murano. We think it's one of the best-looking concepts over the past few years. The body surfaces play with light but keep things simple and clean. The vehicle isn't a crossover or a sedan. It's actually both, and Nissan calls it an "elevated sedan", perhaps along the lines of the Subaru Legacy Sedan but way better looking. The slick vehicle has creases along the hood and body that aren't overdone. And even the mostly solid front end has some visual cut lines and trim that make it more interesting to look at than their luxury brand Infiniti's QX Inspiration that also showed up in Detroit. That's a sweet rear three-quarter shot with the IMs's best angle. That's how to do a roofline. The rear of the IMs shows off a beautiful C-pillar and a poetic roofline that extends all the way to the tail with a gorgeous arc highlighted by yellow trim. The big 22-inch wheels are meaty but sporty, and the single rear taillight element that tucks in behind the rear three-quarter panels is really well done. We love the styling that creates a sculpted look without being busy in any way. It's so good that we think the brand should adopt this design language across all its new vehicles. Did we mention this is an EV? We're so hooked on the looks that we almost forgot to talk about the tech. The IMs is purely electric and comes with a 115-kWh battery pack for the front and rear electric motors for all-wheel drive propulsion. The combined output is 483 horses and 590 lb-ft of torque for what should be rapid acceleration. It should go 380 miles on a single charge, too. The IMS also gets adaptive air suspension for optimal handling, as well as comfort. The IMs also has a fully autonomous driving mode (in concept, of course), and also has Nissan's offers Nissan's new Invisible-to-Visible connected-car technology, which allows the IMs to speak to other vehicles with the same capability. Connected car tech should both communicate automatically with nearby vehicles and provide vital information about the driver and the vehicle. The interior is even more futuristic than the body. Gold and black hues dominate the wide open cabin, and space is optimized thanks to the flat battery in the floor. There are four screens up front, and there's room for five, but the rear seating arrangement is what's truly interesting. The two outboard positions fold down to make for a central "premier seat" for lounging. The absence of almost all physical buttons points to the future of car interiors. Inside, the IMSs robust technology will provide the driver with real-time traffic, an "interior sensing platform" that monitors the driver's physical condition, and even a virtual passenger to keep the driver company. We're guessing this feature would keep the driver alert on longer drives by providing interaction. What will they think of next? Virtual kids to yell, "Are we there yet!???" Though it's unlikely the IMs will ever get built in this form, it's great to see Nissan think outside the box of its current offerings and styling. The IMS truly is an attractive vehicle, and the features inside are brilliant. We're not totally sold on the shape of the steering wheel, but those crazy stalks protruding from the hub, whatever they're for, are pretty cool and very unique. The fact that it's an EV points in the same direction most mainstream automakers are considering for their own futures, and the addition of crossover height with sedan style is safely planning for both segments. We love what Nissan has done, and we hope the IMs is at least some indication of what they'll do for the next generation of vehicles.